A good candidate for the purser yacht jobs will have excellent administrative skills. Whilst experience in such a role on a cruise liner helps, it is not a pre-requisite, whereas being accurate, organised and having excellent computer skills is. Working with management company accountants to maintain accounts, budgets and other financial reports. Working with heads of departments to ensure timely processing of budgets, invoices, payments, credit card and expense reconciliations. Assisting HODs with purchasing, provisioning and purchasing logistics. Responsible for administration, accounting, collection and payment of all onboard monies. Responsible for all crew administration including payroll. Ensuring all crew certification is in up-to-date and correct. Responsible for keeping up to-date crew/passenger berthing lists and reporting any changes. Responsible for all crew travel and guest travel as required. Assisting captain with all yacht logistics as required. Performing Customs, Immigration and Port Clearance requirements. Advanced planning and preparation for owner and guest trips, including on-site reconnaissance as required. Pre-arrival destination/event/venue checks for guests, including transport options, security facilities and bookings for events, sightseeing trips and eating out. Planning and directing events and activities for owners and guests ashore. Assisting owner and owner’s representative out of season as required. How much does a Purser on a yacht earn? 27 pursers have contributed their salary details, with an average salary of between €5000 and €7000 a month. 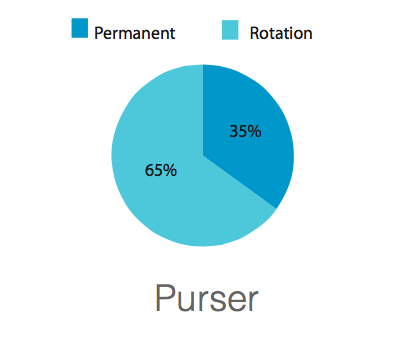 Although it is more common for a purser to hold a rotational contract over a permanent contract, those who are on a permanent contract earn a greater average monthly salary than those on rotation. 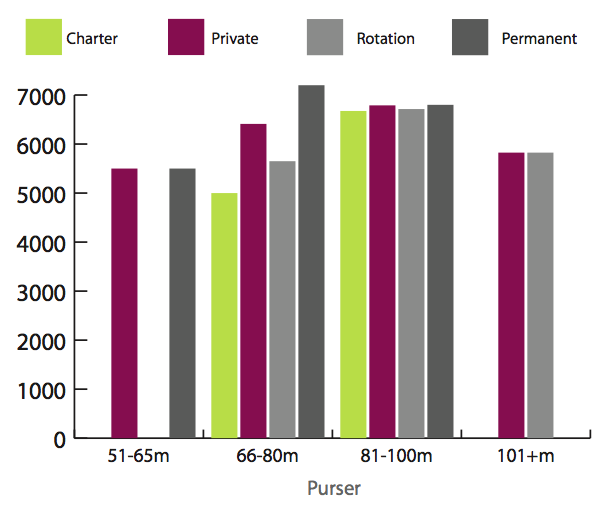 Purser roles on private yachts between 66-80m and 81-100m also command a higher wage than those on charter yachts in the same categories.